I have kept coming across functional safety discussions, most recently at ArmTechCon, and wanted to capture some of the terminology and concepts. To orient the discussion, think of airbags, seat-belts, and tire-pressure-monitoring-systems as safety features in a car. Safety Function or Safety Instrumented Function: A function to take a system to a safe outcome when certain prerequisites on system inputs are not met. E.g. turn on a warning indicator when seat-belt is not used, or tire-pressure is below safe level, or deploy airbags when a collision is detected. Safety Related Control Function: This is the control mechanism by which the safety function is achieved. Safety Integrity Level: The reliability of a safety-related-control-function is captured with a Safety Integrity Level or SIL. A standard is ISO26262. 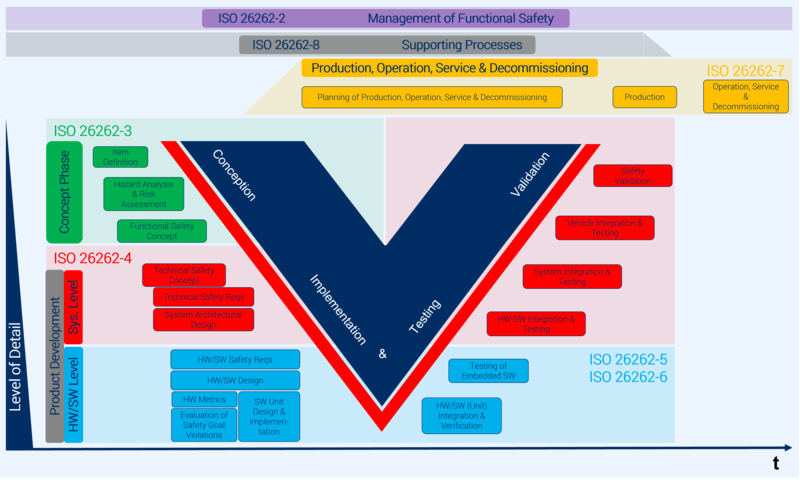 The V shaped functional safety process diagram is here. This process is used to achieve a Safety Integrity Level (SIL) where the SIL1, SIL2, SIL3, SIL4 reduce risk by a progressive factor of 10, i.e. by 10x, 100x, 1000x and 10000x. A HAZOP study is undertaken to understand the risks of the mechanism behaving incorrectly. A good reference, from SIMATIC is here. Software aspects of safety function are discussed in in this whitepaper. Safety systems for robotics are discussed here – it has a table of typical safety issues when a person enters a robot safeguarded area. Industrial robots security was briefly discussed here. Another concept is SOTIF or Safety of the Intended Function, which comes up in functional safety discussions of AI-controlled vehicles. More links on it here. Nvidia safe driving report here.